According to a research by Outbrain, search engines do convey 300% of traffic more than social media to content sites. So how can you let Google know that your website exists? The most common tactic is to focus your attention on the quality of your writing. But the content itself is not able to make you climb the “top 10” of the search results. You should seriously consider link building. Together with link building, you should think about optimizing your blog for search engines. This could have a significant effect as regards the rise of your site in the SERPs. But what link building means? What are some effective techniques for building natural links, without being penalized? Google always updates its algorithms and changes the cards on the table by launching updates as the “Panda” or “Penguin”, which can penalize your site for using unnatural ways to get backlinks. During my online experience, I learned many SEM strategies that can benefit your business. I chose the 10 best strategies I’ve implemented. Each of them has been a great success. Here they are. This method takes a long time and is scalable. You should have a lot of patience to find those links that give the 404 error. It is a really expensive tactic in terms of time and efforts. For example, there are many companies that have changed the name of their brand, so the links have been deleted. I believe that this tactic deserves to be exploited, despite the energies used to get these killer links. How to find broken links? So, when you’ll check the pages, look whether all the links work well. When you find any broken link, you can immediately contact the website owner and inform him about them. I would recommend using the extension of Chrome Check My Links, which will help you find all the broken links (highlighted in red). Have you noticed any “dead links” on the pages of Wikipedia? They are not removed immediately. On the contrary, a note will be added in the bottom of the page with the “dead link”. This will give you the opportunity to replace it with yours. In alternative, you can use WikiGrabber to search all of these links on Wikipedia. After finding them, you will need to create the content from scratch on your site and replace the link on Wikipedia with yours. It is one of my favorite methods to get some good links in 10 minutes. It’s a great community of content curation where users can gather interesting content on the web and publish it in a magazine format. Many of the pages on Scoop.it have a high authority. This type of publications attracts attention through the use of social networks. Choose the category of the post you want to share, search the Scoop.it page more related to it and recommend your content. In my experience, 50% of users will accept it, which means that in 10 minutes of your work, you’ve got quite a lot of quality backlinks. It might seem disturbing to monitor the backlinks of your “competitors”, but I can assure you that you will get great ideas on how to increase the quality of your links. Prior to monitoring them, you will need to discover your most formidable competitors in the SERPs. I use RankTrackr. It’s a paid tool, but you can start with a free trial. In alternative, use this extension of Chrome. 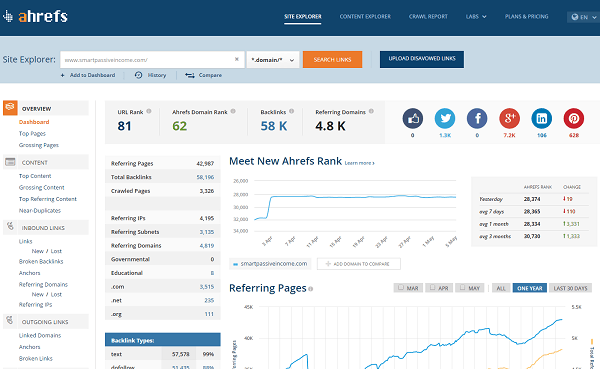 As soon you’ll recognize their keywords and ranking, you can use Ahrefs to get a list of backlinks related to those sites. Checks made weekly or monthly will help you stand at attention to see what SEO tactics your competitors are using to gain more links and devise a plan on how to reproduce them as much as possible. Creating and publishing infographics is one of the most powerful and effective link building strategies in the modern SEO, falling into that niche called “Trend Marketing”. Visual.ly is a leader in this field. Many people stay away from this method, as creating a professional infographic may cost a fortune. I personally use the first one, as it’s simple to use and has various themes (included free ones). You may also want to look for freelancers on oDesk who can do the job at an affordable price. To get a real return of backlinks and visibility of your brand, you will need to give the opportunity to other sites and blogs to post and share your infographic. The idea is to look for guest bloggers who can write significant content for your website. This works in a completely innovative way. You don’t have just to look for bloggers who have time to write a post. The main idea is to build good relationships with the most influential bloggers. Ask them to contribute at your place. What are the benefits of “reversed” guest blogging? You should find out the goals of this strategy, defining the subject of the articles to be written and how long you want the invited guest to contribute to your blog. It’s easy to make a list of the influential people within your niche to work with. Just make the proper research, begin to invite them and talk about this opportunity. The online business not only requires building quality links, but also valuable relationships with customers. Be sure to monitor the activity of your potential customers and control what they do online. They would normally gather in groups to discuss specific topics on forums and blogs. Try to monitor all their moves. You can use Yahoo answers, forums, Facebook groups, etc. 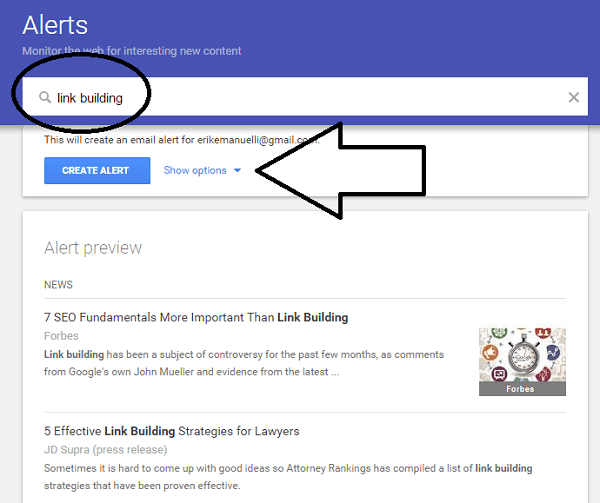 You can also use Google Alerts and add your keywords to track down any reference to your brand or your industry in general. Remember: try to be helpful and friendly, not pushy. It may take time, but you will be rewarded. You have the opportunity to earn a great authority on the web. Users will be able to know you and follow you. The reviews on products, software and services are one of the best ways to get good backlinks on a large scale, especially for ecommerce sites. But how do you capture the attention of bloggers? You can start by offering something for free so they can do a review on their sites, or think about a budget to set for this purpose. It is a fairly intensive process that takes time: you need to find bloggers, contact them, send the products, wait for the review and eventually send a reminder email. Try to find webmasters in your niche or industry. If you sell a specific product or information that help people to learn something like, for example, “ways of making money online”, you should use the strings as “how to make money online,” “earn money at home”, etc. You’ll get a list of bloggers who can be filtered depending the authority of their sites. Now you have to reach them by using their contact form or simply by email, and, with a couple of compliments, make the fateful proposal. Be sure of what you’re writing. Check spelling and grammar errors. Do not be too pushy. I remind you not to not ask them to just post your link and review. Simply put them in a position to decide on your product. It is a simple mechanism to obtain a backlink. When you are using products related to yours or taking advantage of services related to your market, you can offer a feedback to be published on their sites (in their “testimonials” page, for example). You would do something that is beneficial to both sides: you get an important backlink and they earn a feedback on their product. Monitoring your brand is important, as you know, but there are often times when people talk about you and your brand without entering any link. It’s natural (in the end, people are lazy). But you could contact them asking about placing a link to your site within the discussion that has begun. In the end, it does not cost anything and people will do it gladly if you are nice and polite. Follow this tactic and you’ll get many quality backlinks. Here I mentioned my favorite tactics to get backlinks. Take some time to digest them and see how they work. If you know any other tactic, I will be more than happy to listen to your suggestions within the comments. This is a great post buddy! Right this moment, I’m stepping over to it again. Good to see you, mate. How is your new project going? Have a good week, Enstine. And thanks for leaving your comment here today. Good to hear that, mate. You’re doing an amazing job, by the way. Very nice post Erik. Loved the ideas of link building. These are the modern link building strategies. And thanks for your kind feedback. I added it just once, as random and not logged Wikipedia contributor. I am sorry i missed a lot from your pages these days! Nice to be back again, here today I am via Atish’s page. Traffic is an essential part of blogging and we all need it very badly! The methods and links you mentioned in this post is really informative! Especially about Scoop.it pages. As Enstine said, i too created few pages sometime back and I am running a widget too in my page I really neglected to involve with it actively, this post made me to look into it more deeply. I really never thought of that benefit you mentioned here, I need to have a check again. The other things are really a bit time consuming thing but worth trying it too. It’s great you landed here from Atish’s blog. Hope these tips are going to help you increase the traffic at your site. You should give Scoop.it a try, it’s worth the investment of your time. it’s another great informative post for all bloggers. Your all 10 tips are awesome and every blogger must follow these tips for their success. glad this post was useful. Thanks for the mention, Kenny! Be sure to share the link when you’re done! You’ve presented a great post and nailed the topic too. I aware of few ideas like content curation, guest blogging, online discussions, citations, round-up posts to build links effectively. But other ideas are new to me and I’ll try them for sure. It’s quite interesting to know the way of building links to Wikipedia and feedback. Thanks for writing this post. Have a great day! Glad to hear you learned something new from this post. I really appreciate your comment and share. Great tips on link building! Especially the ones showing how to build links by replacing the dead links on WikiPedia. I have started researching for dead links and I hope that I can find a few to replace. Happy to hear you liked the post. The Wikipedia strategy is really a good one. Backlink generated rightly will always almost generate traffic and ranking for a website. Searching websites for broken links and replacing dead links in Wikipedia are innovative tactics to be exploited. The above comment was left in kingged.com where this post was found. creating links is good for SEO and traffic. But it’s important to focus on working the right way. We don’t want to be penalized, right? good luck implementing these strategies. Thanks for sharing your blogging experience here, Sneha. I’ve had a lot of success with some of these and some success with others but none with Wiki – very little to no joy there *ever. * I can’t seem to find the line between info & promo. Your tip about “creating the content from scratch” may get me over that. Thanks! the “secret” is make it look natural. I guess when you understand how to write the content the right way, it’s done! Awesome tactics shared, all the listed tactics seems very useful and some of them looks like I didn’t tried or never know before. Will check out some of resources listed above. Hope these tips will help you get more backlinks and traffic, Vicky. The sites you have listed for creating Infographics seems super useful which I came to know just a moment ago. Great strategies! I think niche link building with unique and quality content is still guaranteed SEO rankings Thanks for sharing this valuable information. This will definitely help me to make better strategies in 2015.
glad you liked the post and thanks for taking the time to leave your kind feedback. thanks for sharing…! Actually, it is really information about link building. I love what you mentioned about Dead Links on Wikipendia, but unfortunately my IP was banned since last 2 years. I’m not able to get into Wikipendia. Anyway, did you have to some tips about how into Wiki after ip banned. You know..? The most I love in this post is guest blogging because it is the most powerful ways for building authority and backlink. sorry to hear about your I.P. being banned. I guess the secret is providing high value to the contributions of content/site/links to Wikipedia, and make them natural! Yes, guest blogging is still alive, and it really works. Of course, you must do it the right way. Thanks for commenting, and have a great rest of this week. Erik, glad you mentioned Scoop it, I had not used it in some time and have updated my profile and started to use it again. I used to love that one. I had not tried some of the other methods you show here. except review of bloggers. You introduce us to some really neat ways to get links, thank you! Yes, sometimes I forgot Scoop.it too, but lately I found out that it may bring a lot of traffic and new connections. Glad to hear you learned some new ways to gain backlinks and new visitors form this post. have a good rest of this week, Lisa! Perfect, well I must say Citations concept of building links is super awesome and I think trust part is necssary to get links from the bloggers. glad you liked these new ideas. Be sure to implement them and let me know how it goes. “Replace Dead Links in Wikipedia” caught me off guard. It’s very cool, you just need to search it and use the tactic on searching that you shared. Doing so, you can replace the dead link with yours, then you can get free traffic from Google. Cool trick and easy. WikiGrabber will be useful to easily find link opportunities on Wikipedia based on keywords. However, you need to consider Human Moderation and Add News. For example, Human Moderation, Wikipedia doesn’t need spam, so think about adding quality to Wikipedia’s index. happy to hear you liked the Wikipedia dead links strategy. you don’t want to be labeled as spam and have your site flagged. Thanks for taking the time to visit and comment, Metz. I second Metz; that Wikipedia tactic is really clever. i had no clue you could do this; even edit the link, let alone add your link. If you do a fine job and link up with relevance in mind I know this approach would drive serious, targeted traffic. Neat that Wiki lets you do this. Digging deeper now. you should give it a to to this “Wikipedia dead links” strategy. Have a nice weekend in that side of the world. Thanks for your visit and comment, my friend. Link building is the main part of seo and I guess every bloggers can do link building strategies for getting traffic easily. But we must avoid doing spam tactics. Hope you learned something new from this post, Tushar. Thanks for the tips. Blog post and link building and certainly blog walking that I do now can increase traffic. Let me know how it goes, Aunurrahman. You are exactly right. Google will kicked if any one grow unnatural ways to get backlinks. Here you give awesome tips to link building which is very much helpful to make quality backlink and drive traffic. 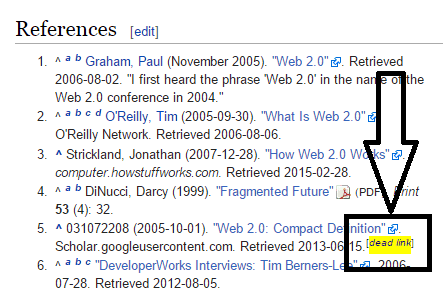 Thanks for your awesome tricks to give attention on the quality of writing and replace dead links in wiki. Brilliant Content As Before! Glad to hear you appreciated the content! Wow Erik This is really an awesome collection of link building strategies which a professional always does not reveal. THanks for elaborating all these strategies. I am back to visit your blog and you’ve a huge information on your blog. And this I can not read in a day. Adding this blog to my daily visit list so that I can read all your posts and learn learn and learn a lot from them. happy to hear you find something useful. Good source of new types of backlinks, Thank you Erick. Currently i’m trying wikigrabber for some wikipedia backlinks. Let me know how it goes, Rekhilesh. In modern seo it is very difficult to choose between good backlinks and bad ones, but the above methods are great if one follows them with basic techniques. Thanks agian. I hope these techniques can work for your site. Even I work as Junior SEO,so link building is quite difficult for me. But after reading your article I can build links easily further. So a very BIG THANK YOU!! Hope you keep on posting about link building in future as well. will keep a watch here for more knowledge. Glad you enjoyed the information in this post, Aalia. Thanks for this guide. These Link building tactics are very useful. But these days it is getting very difficult for a beginner to building links through advance ways like PBN, Guest posting from high authority blogs. But need to learn these tactics gradually and build good backlinks for long term. Many thanks for this wonderful share. Glad to have you helped, Santanu. Great article to understand to Generate Free Traffic from Google with amazing tips. I’m sure if we follow just some tricks from this article so surely we will get some traffic.